The winner will be published in Overland 230, autumn 2018. 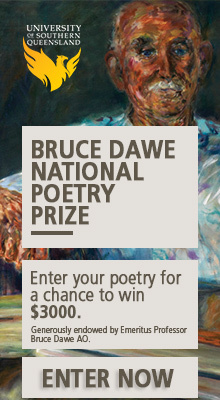 The prize is open to writers nationally and internationally, at any stage of their career. Submissions will be processed electronically. Stories should be formatted at 1.5 line spacing and a minimum of 12-point font size. Each entry must be accompanied by a fee of $20 or $12 for Overland subscribers. It is possible to become a subscriber and simultaneously enter the competition at a special price of $56. The winning story will be published in Overland; runners-up will be published at overland.org.au. Other entries may be considered for publication. The closing date is 11.59pm, 19 November 2017. Late entries will not be accepted. Enter the Overland Neilma Sidney Short Story Prize.